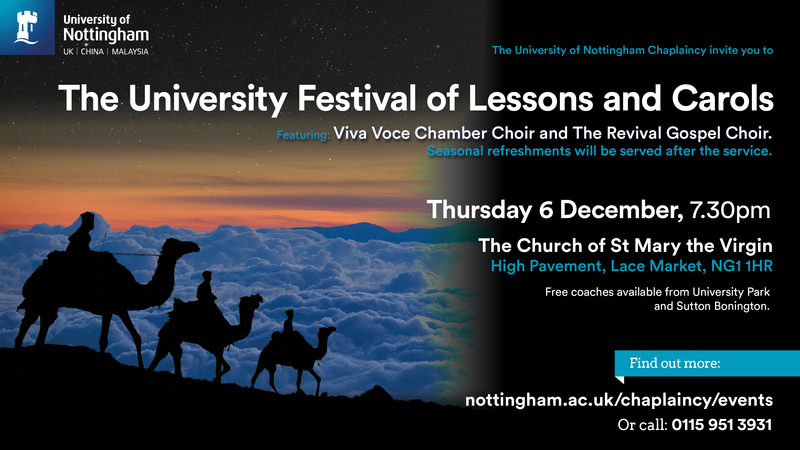 Hosted by the Chaplaincy, this Christmas Carol Service combines a wonderful mixture of traditional and contemporary Christmas songs. We all have the chance to join in the congregational singing and listen to the outstanding voices of the Viva Voce and Gospel Choirs. This year will also feature our Lutheran Chaplain and classical soprano Reverend Paulina Hlawiczka. The Carol Service will be held at The Church of St Mary the Virgin, High Pavement, Lace Market, NG1 1HR on Thursday 6 December at 7.30pm. Please join us after the service for mulled wine and mince pies. This is a free event – no tickets are required. It is always well attended so please come early for a good seat. Free coach tickets are available for travel between University Park and St Mary’s (with a stop on Derby Road for Jubilee Campus students on the return journey) and also from Sutton Bonington Campus. Buses depart from East Drive on University Park Campus at 6.30pm and tickets can be booked at tinyurl.com/unicarols. Sutton Bonington buses depart from the Main Entrance at 6.10pm and can be booked by sending an email to val.owens@nottingham.ac.uk. Coaches return from St. Mary’s Church at 9:15pm and 9:30pm. For more information, visit nottingham.ac.uk/chaplaincy/events or call 0115 951 3931.